Let’s be clear about the consequences of the defiance of the law on August 25, ‘Black Saturday’, by hundreds of bandsmen. The Parades Commission used to be a paper tiger. Now it’s a dead duck. 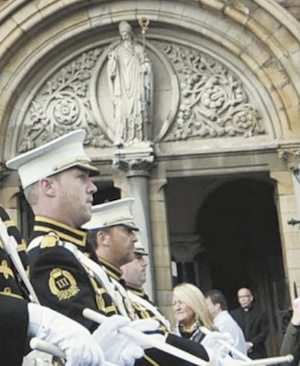 Loyalists have discovered that the PSNI won’t step in to enforce Parades Commission rulings and furthermore that if enough of them defy the law, then there’s no way the police are going to clog the courts with what -200, 400 prosecutions? Nationalists have discovered a few facts as well. First, it’s not an arrestable offence to break a Parades Commission determination. Although the police could step in and try to enforce a determination, in practice they never do even though people refusing to obey a police instruction could be arrested for obstruction. Although on paper you can get six months or fined 5,000 pounds so far no-one has been successfully prosecuted for breaching a determination. None of this information is new. It simply demonstrates the Parades Commission is a paper tiger. What is new is the realisation that the Parades Commission offers no protection whatsoever from sectarian harassment as promised in the Good Friday Agreement. If you compare events at Ardoyne or Rasharkin or Ballymacarrett each year it is abundantly clear that the PSNI places incomparably greater emphasis on forcing unwanted loyalist parades through or past nationalist districts than it places on enforcing Parades Commission restrictions on such marches. The stark fact is the PSNI does nothing at all to enforce restrictions, as we saw regrettably on August 25 but have seen on many other occasions in the places just mentioned. They video breaches, take names and send papers to the prosecution service -- then nothing. Big deal. Now loyalists have discovered if they defy restrictions en masse they can get away with anything. In short, the Parades Commission is a dead duck. The only way to protect nationalist communities from sectarian harassment and remember that’s why the legislation was established in the first place in 1998 is to reroute a parade. The police will enforce rerouting as they have done at great cost, human and financial -for example, in Portadown. However, the Parades Commission will not bite the bullet and reroute contentious parades, such as the ones past Ardoyne, by pathetically small numbers of marchers who this July took a bus to Ardoyne in order to provoke nationalists. Loyalists have also learned from Black Saturday that the bigger your parade the more you can get away with -an extremely dangerous lesson. The abject failure of the PSNI to devise appropriate tactics has had a profound effect on nationalist confidence. Notice the silence from Sinn Féin who are deeply embarrassed at the police failure. They are silent because there is absolutely nothing they can point to as a demonstration of the value of supporting the PSNI or sitting on the Policing Board when it comes to the parades inflicted on nationalist districts each summer. Unionist spokesmen, you can’t call them either politicians or leaders, have shown their true colours in the past few weeks. It is crystal clear that the only procedures they will accept are procedures acceptable to the Orange Order, the Apprentice Boys and the Black. The proposals of the DUP and Sinn Féin in 2010, laughable as they were, were scuppered by the opposition of the Orange Order. Any future attempt will be met with the same opposition which means the DUP is not negotiating in good faith. The embarrassed silence from Sinn Féin is an indication that they are trying to rethink their position on parades and the policing of parades but have no answer. Primary legislation is required to create a body with teeth but that means the interference of Westminster, a problem for Sinn Féin. What is certain, however, is that the planned parade and monster rally on September 29 will be a critical test for the PSNI and its credibility after the debacle on August 25.